Negative feedback may not work like we think it does. Neuroscience has already us shown that our brain perceives social threats in the same way as it does physical threats. Being social animals, our brain’s response to physical threat and social threat is fight or flight. A recent study at Harvard Business School used a real company to follow 300 employees who received the normal peer-feedback that we all receive at work. Their observations were that the response to negative feedback was, whenever possible, to go work with someone else who would confirm their own positive view of themselves, their ideas or performance. This is not surprising. The normal human response is to surround ourselves with people whom we feel less threatened—no matter how subtle the threat. The idea behind performance reviews, and feedback in general, is that to grow and improve, we must hear about those negative aspects we may or may not know about ourselves. The working hypothesis is that brutal honesty motivates us to improve. When in fact, given the choice, there are multiple outcomes of receiving negative feedback—like choosing to work with someone else. If we can’t run, we likely fight, or, we are learning, the inability to escape is a source of stress that can lead to anxiety and depression. It’s not to say there’s no value to negative feedback, but negative feedback must be offered in the right context. Some practices might suggest balancing positive and negative feedback; the old sandwich method of positive-negative-positive, or even the 10 to 1 ratio of positive to negative due to the weight with which we perceive negative feedback. It’s not about balance or keeping tally. 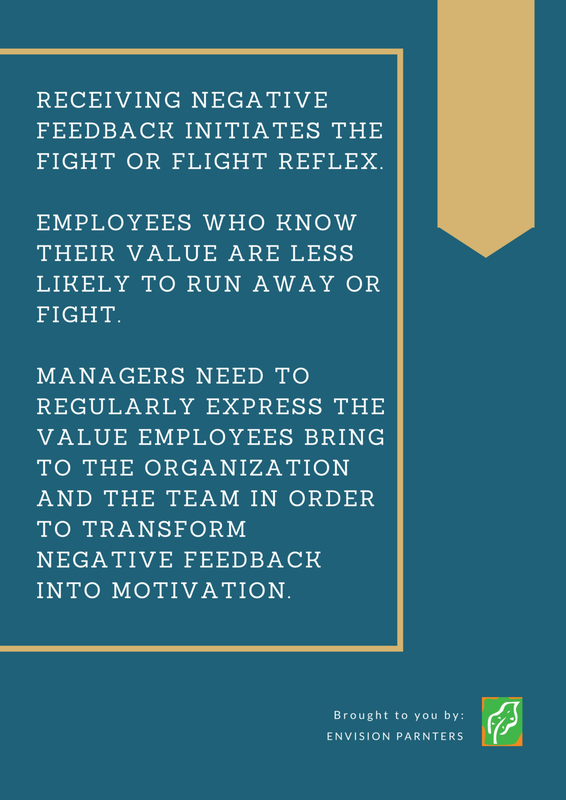 Rather, we need to know our value to the organization, the team, to the person giving the feedback in order to use negative feedback as a motivator. Managers, and all of us, need to regularly express the value that others bring to our work, life and the relationship whatever the form. Then when you give me feedback, I am less likely to run or fight. This is the general idea of personal commitments. In the context of a healthy marriage, for example, negative feedback is taken in the way it was offered—as an opportunity to improve. Not only is there trust in the relationship, there is a relatively positive and affirming relationship in which the feedback is given. When I am told to pick up my socks, I don’t go looking for another partner. A neat part of this study was to allow people to write for 10 minutes about the values that were most important to them. When this was done prior to receiving negative feedback, the shopping around effect of negative feedback almost completely disappeared. Affirmation of ourselves is always genuine (in our mind). Which shows that our affirmation of others must be also be genuine for the threat of negative feedback to be reduced. The compounding problem of running away from negative feedback toward those who will not criticize is that we will never receive the necessary feedback needed to improve. We know that when everyone in the group thinks the same, there is never improvement—which is one form of change. It’s a paradox. For negative feedback to work, an employee needs to feel both valuable, and a need to improve. For more on affirmation and appreciation, see “The Five Languages of Appreciation in the Workplace” by Gary Chapman and Paul White.